You are here: Home > What do lactivists and anti-vaccine parents have in common? What do lactivists and anti-vaccine parents have in common? “Unvaccinated is the biological norm for human beings. Natural immunity, the sole source of infant/child immunological protection in nature, has evolved as a result of 200 million years of Darwinian pressure to become the perfect defense against disease. When we move away from this biological norm, it is up to us to research the effects of this, and this puts the onus on vaccines to show there is no risk associated with its use. Just as we examine the risks of other changes to our biology, like a diet filled with fast food (again, we don’t speak of the “benefits” of avoiding McDonalds), the same holds for vaccination. Or rather, should hold. The fact that it doesn’t speaks to the power of Big Pharma and the societal push for vaccines to be seen as the norm. Lactivists treat breastfeeding like antivaxxers treat natural immunity. While unvaccinated is indeed the biological norm, we can do better than nature. Limited to only natural immunity, infants and children become ill and die in droves. 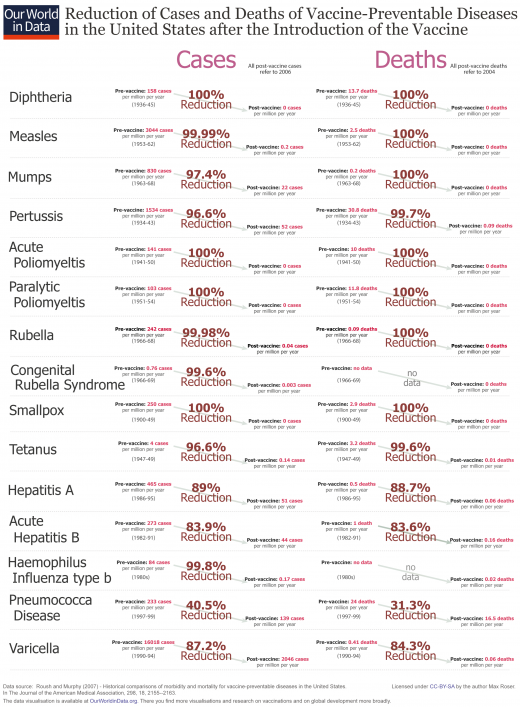 As this impressive graphic shows, both cases and deaths from vaccine preventable diseases have dropped dramatically with the introduction of vaccines. There has been literally a 100% drop in deaths from diphtheria, a 100% drop in deaths from polio, a 100% drop in deaths from rubella and smallpox, previous a dreaded disease, was eliminated altogether. Unvaccinated may be the biological norm for infants and children but deaths from vaccine preventable diseases are also the biological norm. Natural immunity is indeed the product of hundreds of millions of years of evolution, but that didn’t make it perfect or even close to perfect. While there are certainly benefits to natural immunity (it can be longer lasting than vaccine induced immunity), there are also considerable risks. In order to acquire natural immunity, you have to survive the disease and many don’t. In the case of vaccine preventable disease, nature is good, but technology is better, safer and far more convenient. You’d have to be kidding yourself to pretend otherwise. The above quotes, while typical of antivax beliefs, do not come from antivaxxers. They come from lactivists. I merely substituted vaccine rejection for breastfeeding. It was easy to do because the claims lactivists make about breastfeeding mirror the claims antivaxxers make about natural immunity. In both cases they represent wishful thinking, not reality and are based on the belief that natural selection creates the best possible outcome. This view was derided by evolutionary biologist Stephen J. Gould as the Panglossian paradigm. The paradigm references Pangloss, a character in Voltaire’s Candide who believes that “all is for the best in this best of all worlds.” In the context of evolution the Panglossian paradigm imagines that everything that exists in nature today is the product of intense natural selection and represents the perfect solution to a particular evolutionary problem. In the case of immunity the Panglossian paradigm insists that natural immunity represents the perfect solution to the evolutionary problem of disease. In the case of breastfeeding the Panglossian paradigm insists that breastfeeding represents the perfect solution to the problem of infant nutrition. The point was that biologists were too quick to insist that every feature was adaptive and a result of natural selection. Spandrels are triangular structures produced when two round arches meet. They are necessary byproducts of joining rounded and flat surfaces. Nonetheless, in many churches they are richly decorated and the entire artistic vision for a space can be shaped by the spandrels. One might, Gould points out, be lead to think that the spandrels are there in order to be used for paintings, and not that they are necessary by-products nicely dressed up. The worldview he criticizes treats anything, whether spandrels or five fingers, as the product of intense selection, a perfect solution to the problems it faces. In other words, an existing natural feature, whether immunity or breastfeeding, may not be the result of evolutionary pressure, it may be an incidental feature of a solution to an entirely different problem or it may represent the limits of genetic adapatation. For example, it would undoubtedly be evolutionarily advantageous to have eyes in the back of our heads yet we never developed them. Instead technology gave us mirrors, which we can use to escape our biological limitations and see behind us. Two eyes don’t represent the best of all possible outcomes, merely the outcome that we have. Nature is NOT perfect and therefore technology can improve upon nature. It’s easy to see the limits of the Panglossian paradigm in immunity. Natural immunity is clearly deficient and involves a massive amount of disease and death. Just as rear view mirrors allow drivers to escape the limitations of only two forward facing eyes, vaccines allow us to escape the limitations of an immune system that requires us to be exposed to a deadly pathogen (and possibly die) in order to become immune. It’s harder to see the limits of the Panglossian paradigm in breastfeeding because lactivists and their organizations have spent dozens of years and millions of dollars explicitly denying the limitations of breastfeeding. They’ve resorted to lying in order to do so: lying about the high failure rate of breastfeeding due to insufficient breastmilk, lying about the high complication rate from dehydration or jaundice and lying to exaggerate the benefits of breastfeeding. 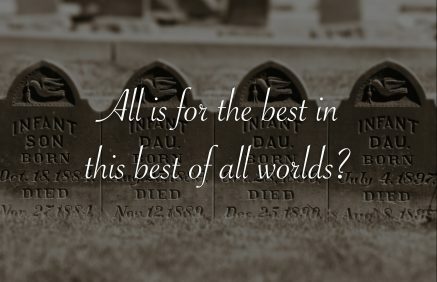 They lie not out of malice but out of a deeply held belief in the erroneous Panglossian paradigm that evolution produces the “best of all possible world” when it merely produces survival of the fittest. They assert that formula cannot possibly be as good as breastmilk when the reality is that it, like vaccines, could ultimately be better, safer and more convenient because we can often improve upon nature. Breastfeeding may represent the result of hundreds of years of evolution but evolution does not produce perfection. Lactivists who refuse to recognize their error are no different from antivaxxers who refuse to recognize the same error. What do lactivists and antivaxxers have in common? Neither truly understands the limitations of evolution, and lacking that understanding make extravagant and false claims about the virtues of the biological norm. off topic: interesting op ed today in the NYTs questioning the mantra of shifting medical care into lower-cost settings. a lot of relevance for birth issues! “Hunter-gatherers used to eat like this…” – sure, but that’s all they could get, and huge numbers starved. “We evolved this characteristic because…” – evolution only leads to survival of a species – not individual perfection. And the irony of arguing about the hunter-gatherer lifestyle on the internet? Sigh. I think the part they’re missing is that hunter gatherers ate everything they could get their hands on, so the true diet resemblant of the motive behind theirs IS the “see-food” diet. Eating stuff similar to that they coincidentally happened to have is just silly. Waaaaaaaay o/t, but today I scored my first real, professional job! I am going to begin as a pre-licenced clinical social worker. Congrats! That is a great accomplishment and I wish well in your first job. Congrats! I hope you absolutely love it and they appreciate you properly! Congratulations! Social workers are heros. In the first paragraph after your confession, “It was easy to do because the claims lactivists make about vaccines ” – it should be “the claims lactivists make about breastmilk”.